The much-anticipated opening of Walt Disney World‘s Toy Story Land is set for June 30, and “Good Morning America” has six fun facts about the new attraction to share. Guests in Toy Story Land -– located at Disney’s Hollywood Studios -– will feel like they have shrunk to the size of a toy as Woody, Jessie, Buzz, Slinky Dog, the Aliens, Green Army Men and other fun-loving Toy Story characters come to life in the larger-than-life outdoor setting of Andy’s backyard. 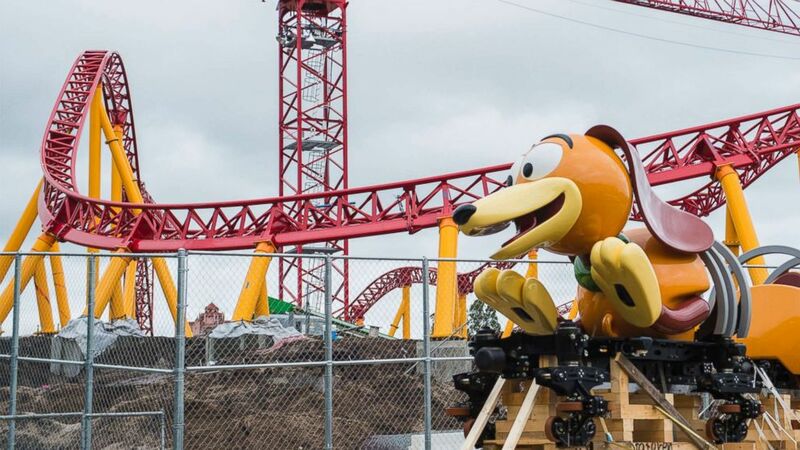 The Slinky Dog Dash ride arrives at Disney’s Hollywood Studios. This swirling saucer attraction is coming to Toy Story Land at Walt Disney World Resort. — More than 400 toy blocks fill Andy’s backyard. — In Toy Story Land, Andy’s footprint is about 25 feet long or the equivalent of a size 240 shoe. — It would take a Green Army Man roughly 12 steps just to travel the length of one of Andy’s shoeprints. — You would need a backpack the size of a school bus to carry the Buzz and Woody figures that tower over Toy Story Land. — The weight of the Slinky Dog Dash track and support columns weighs almost as much as 125,000 gallons of milk. — Together Rex and the Jenga Tower are as tall as 7½ Green Army Men standing on top of one another. Guests will be surrounded by giant building blocks, game board pieces and more. Toy Story Land is coming to Disney’s Hollywood Studios. Across 11 acres, Toy Story Land will be an all-new addition to Disney’s Hollywood Studios and set against the backdrop of Andy’s backyard. One of the main attractions includes Slinky Dog Dash, a ride for the whole family where Slinky Dog twists his coils around curves, hills, and drops across Toy Story Land. Alien Swirling Saucers is another fun attraction for guests where they will board a toy rocket for a spin through space. Woody’s Lunch Box will be a new quick-service window serving tasty meals and old-fashioned soda floats within Toy Story Land at Disney’s Hollywood Studios when it opens in summer 2018. Crayons, Rubik’s Cubes, Cooties, Green Army Men and other toys and games will pour on the nostalgia for park-goers. Even the lampposts will be shaped like Tinkertoys. There will also be a new place to eat: Woody’s Lunch Box will serve up tasty meals and old-fashioned soda floats from a walk-up window in a setting surrounded by Andy’s favorite toys and a giant vintage thermos. In addition to the new attractions, Toy Story Mania!, opened in 2008, gets an all-new colorful toy carnival game box entrance when the new land opens, designed to replicate the box that the Toy Story Mania! game came in. Recently updated with a third track, the popular attraction will put even more guests in the carnival playset action taking aim at 3D objects –- using everything from baseballs to creampies –- in a variety of whimsical, fast-paced games. To the high-scorer go bragging rights.